So this is it, the final week of my paternity leave. And it's been incredible. Yes, being Mr. Mom has its minor challenges, like spit ups and diaper blowouts. But these things are dwarfed in comparison to the countless moments of wonder and amazment that come with watching your baby grow. Plus a dirty diaper has nothing on my inbox - you should see some of the hate mail I get (which reminds me, I promised I would post some). I fully intended to be more active on the blog, as I had suggested. Sorry I never followed through with that - I've simply enjoyed my time being a dad. And time certainly flies when you're having fun. My return to work will be bittersweet, since I'm longing to pick up my ongoing conversation with you, the readers. Over the past several months I've gathered all kinds of inspiration, so don't be surprised to see a baby metaphor or two. 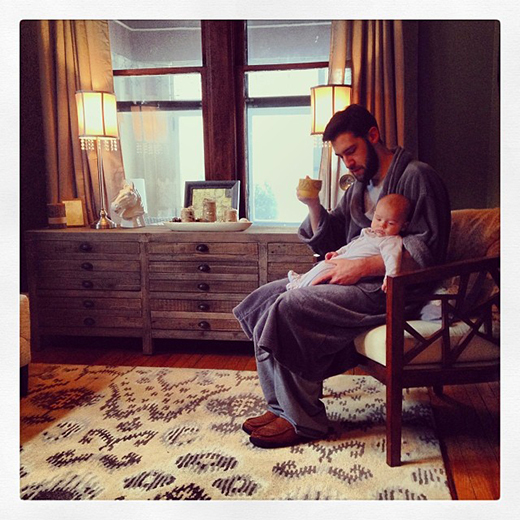 I'll leave you for now with this Instagram pic my wife Jessica took of me one January morning. It certainly sums up my experience.